I have a huge love hate relationship with mom groups. I love them for solidarity, support and as a source of usually good information and advice. 1- The "Should I take my child to the hospital and can you help me diagnose this?" question. I am guilty of doing this when M had a rash once. We still ended up having to take him to the doctor obviously, making the picture pointless. I have since deleted the post because my child will grow up someday and not want random pictures of his rash all over the internet. Small ailments aren't a big deal- we all have questions sometimes. It's the medical emergency posts that get me. 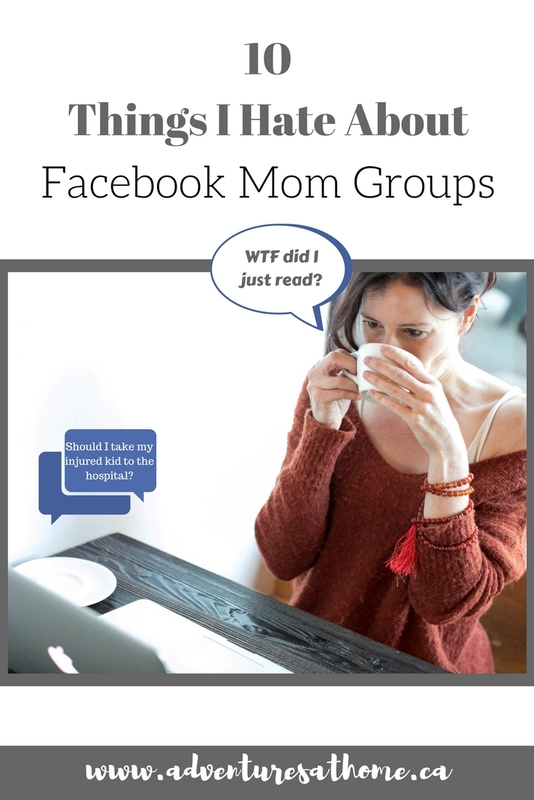 If you have a medical emergency, pass mom group and go straight to the hospital. High fevers that won't come down, badly bleeding wounds, head injuries- just GO. No we do not know the current wait time at the ER because it's triaged and emergencies can come in at any moment. Clinics and your family doctor are great for non emergencies. 2- The Bad Advice Masked As "Don't Judge, We're All Doing Our Best"
Mom 1: "Your baby is so precious, and congrats! Just a little tip, babies sleep safest on their backs with just a fitted sheet"
Mom 2: "^ There's always someone who's going to judge. DON'T JUDGE HER, everyone parents differently! You're doing a great job OP, my baby didn't sleep through the night until 5 weeks." Mom 3: "Mom 1, I used bumpers and my kids were fine!!!" Research and do whatever you want with your own kids- just please don't give unsafe advice out to other moms. It isn't judging to provide safety information. We don't know if this mom has done research or not on safe sleep, so it's always best to give the proper info and let her make her own decisions afterwards. If you feel like its absolutely necessary to have thousands of women examine your child's feces on an internet forum, have the decency to put the picture in the comments. Yes we are all moms. Yes we have all dealt with our own child's poop. No we don't want to see your kids diarrhea as we're scrolling with our morning coffee. Everyone has the right to get support and talk to someone about their problems. That's the great thing about friends, family, marriage counselors and therapists- they will listen to all of that. Please stop posting horrible things about your spouse, ex, your child's step mother, your court dates, etc. The internet is forever guys, and the stuff you post could somehow get back to these people, or worse, your kids someday. Don't get me wrong, general advice questions are fine, but when you get into swearing, name calling, or vivid graphic details of how your spouse cheated, it just gets awkward for everyone. Also, Facebook is not anonymous and you never know who else may be lurking and taking screen shots of what you post. Check out Reddit- It's as anonymous as you want it to be and there are a ton of support groups. The memes, the "mommy's sippy cup" wine glasses, the constant "just go home and have a glass of wine" comments. I can't stand this mommy needs wine culture that we seem to be in right now. There is absolutely nothing wrong with drinking wine occasionally, but it seems like any time a mom is stressed out she gets bombarded with "just go home and have some wine" comments. The problem comes when women actually have alcohol problems and are able to justify it with #momlife. Children should not be blamed for their parents alcohol consumption. Period. One thing that sparked me to write this was some awful pregnancy advice I saw in a mom group this morning. It was along the lines of "I drank alcohol and ate sushi when I was pregnant and my kids are fine!" I'm sorry, what!? You are honestly going to tell other mothers to do exactly what you're not supposed to do because your kids are fine? We get it, you're too cool for school and march to the beat of your own drum. Recommendations are in place for a reason, either follow them or don't but don't give dangerous advice to other people. When a person posts a picture of their child when it has absolutely nothing to do with their post because they want people to tell them how cute their child is. I know you've all seen posts like these. This is the word someone gets called if they try to provide proper advice relating to any kind of safety (food, crib or carseat), when a mom admits to being on the PTA and liking it, when a mom admits to not allowing certain things in her home (sweets, screen time, etc). I've been called this for calmly and politely sharing car seat safety info before when someone was using an expired seat. I wasn't being condescending at all. Can we please stop calling EVERY mom with an opinion/advice a Sanctimommy? I'm including this in the hopes of making people think. I'm guilty of doing this a time or two, back when I was naïve to the dangers of over sharing. It's easy to feel comfortable in a mom group because you see the same people post again and again. You don't however see who may be lurking. We never ever know who is in a mom group. There are usually thousands of members. Are some people using fake names? Are some of these "moms" not moms at all? We can't know that. Maybe I've been watching too many true crime stories on YouTube lately, but please stop posting your child's whereabouts- especially if you aren't going to be with them. For example- every time you comment with a positive review of a daycare, we now know where your child goes to daycare. Every time you ask a question about your child's school, we now know where your child goes to school (and sometimes even what class they are in). Please just be careful with the comments you make. Never put your child's name on the outside of their book bag. Yes LL Bean bags are super cute when monogramed, but having their first name on it makes them an easy target to call over. Update yourself on the security measures at your child's daycare/school. Review your list of safe people who are allowed to pick the child up. Recently I had to revise our list to remove someone we are no longer friends with- it's an easy and important thing to do. If your child is old enough, create a safe word. Make sure that anyone who picks up your child knows the safe word. Also, let the child and school/daycare know if someone else will be getting them that day so it's not a surprise. Delete your reviews & comments (or re word them). Search your name and the daycare/school name at the top of the mom group, and the posts where you have commented reviews or questions should come up. Just delete them. Never put the name of your child's school on your vehicle. You may be proud of where your child attends school, but it doesn't need to be displayed on the outside of the vehicle. We all work hard. We all love our kids and want what's best for them. Some of us like working, some of us like staying home. It doesn't matter, and it's not a competition. I hate the term "Full time mom" because we are ALL full time moms. We don't stop being moms when we go to work. We all have the same amount of house work to do every day, we all have to prepare dinner at the end of the day, working moms aren't on "vacation" when they go to work and stay at home moms aren't "lazy". Whenever a mom mentions either staying home or working, there are always comments like "must be nice". I love aspects of being at home and working so much that my ultimate goal is to be a work at home mom, which is the best of both worlds. Because we all have different struggles and triumphs, I, along with Amanda from Legally Mommy have created a group specifically for working moms to talk about work & home related things in a supportive and understanding environment. Even though this is a group for working moms, stay at home moms are welcome to join for any questions relating to volunteer work, going back to work, transitioning from mat leave, etc. This is NOT a group where we talk about or bash stay at home moms, it is simply a support group for working moms to discuss a multitude of topics relating to work/home life balance. My Review Of Parlee Beach Campground! New Listings On My Etsy Shop! Our Little Townhouse Makeover Series!